WASHINGTON - Japan's nuclear crisis is spiking demand in the U.S. and a few other places for a cheap drug that can protect against one type of radiation damage -- even though the risk is only in Japan. Health agencies in California and western Canada warned Tuesday that there's no reason for people an ocean away to suddenly stock up on potassium iodide. Some key suppliers say they're back-ordered and are getting panicked calls from potential customers. "Tell them, 'Stop, don't do it,"' said Kathryn Higley, director of radiation health physics at Oregon State University. 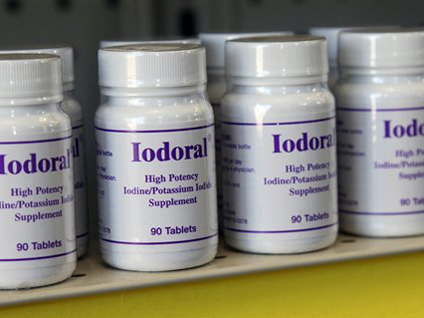 "There's a lot of mythology about the use of potassium iodide," added Dr. Irwin Redlener, a pediatrician and disaster preparedness specialist at Columbia University. "It's not a radiation antidote in general." The pill can help prevent radioactive iodine from causing thyroid cancer, for which children are most at risk in a nuclear disaster. Japan's Nuclear Safety Agency has stored potassium iodide to distribute in case of high radiation exposure, and the U.S. Navy is giving it to military crews exposed to radiation as they help with relief efforts in Japan. But government and independent experts say that Americans have little to fear from any radiation released by the damaged Japanese nuclear plant. "You just aren't going to have any radiological material that, by the time it traveled those large distances, could present any risk to the American public," said Nuclear Regulatory Commission Chairman Greg Jazcko. Other governments echoed that warning. "We do not expect any health risk following the nuclear reactor releases in Japan, nor is the consumption of potassium iodide tablets a necessary precaution," British Columbia's health ministry told the public Tuesday. In Russia, where memory of the very different Chernobyl disaster 25 years ago is strong, media reports said pharmacies in Vladivostok, a major port just west of Japan, had run out of the pills. "The mass media tells us that the wind is blowing the other way, that radiation poses no threat. But people are a mess," Valentina Chupina, a nanny in Vladivostok, said in a comment posted on the website of the newspaper Delovoi Peterburg. She said people don't believe the government will warn them if something goes wrong so potassium iodide is being bought up in the pharmacies. In the U.S., whether people fear fallout from Japan or a nuclear accident here, potassium iodide seems to have become something of a hot commodity. "I feel strongly there is a high likelihood we will have radiation coming from Japan," said Tammy Lahutsky as she waited at the Texas Star Pharmacy in Plano, Texas on Tuesday. There's not, but she bought six bottles for herself and a friend, anyway. "I can't tell you how many women are calling up in tears," said Alan Morris, president of Anbex Inc., a leading supplier. His order line ringing in the background, Morris said the company had sold out of more than 10,000 14-pill packages and doesn't expect more supply until April. Internet seller NukePills.com donated 50,000 potassium iodide tablets to a physician-run disaster-relief team in Japan, pills not suitable for U.S. retail sale because of packaging issues and expiration dates. Regardless, "these pills really needed to go where people were in the most dire need," said company president Troy Jones. Meanwhile, he said he's taken over 6,000 orders since Friday and is selling a liquid version until more pills become available. Potassium iodide, a salt also known as KI, has just one use: It shields the thyroid from radioactive iodine. It blocks no other type of radiation, and protects no other body part. The drug, either pill or liquid form, is sold over-the-counter and is considered safe, although some people may experience allergic reactions. Potassium iodide is most important for children and pregnant women, because a growing thyroid is much more active and more likely to absorb radioactive iodine, said Columbia's Redlener. It should be given within a few hours of radiation exposure -- but isn't considered that useful for people over age 40. At the same time, the crisis renews a question that the U.S. government has debated for years: Should people keep small supplies of potassium iodide on hand in case of a local radiation emergency? The federal government already stockpiles the drug, and offers enough for states also to keep on hand to treat every resident within 10 miles of a nuclear reactor. About 22 states have requested or received some of those doses, and localities periodically offer free supplies for nearby residents to store themselves. But radiation health specialists debate whether a 10-mile radius is big enough -- and whether people should store their own. Some are pushing the Obama administration to reconsider. Obama health officials wouldn't comment Tuesday. "My feeling is I would have every household within of a plant have it in their medicine cabinet," said Redlener, adding that the Japan crisis illustrates the difficulty of getting pills from a central warehouse to panicked people during an emergency. Even on the East Coast, some health departments reported increased interest from power-plant neighbors Tuesday: A Pennsylvania hotline that normally gets five to 10 calls a week about storing the pills has fielded 85 such inquiries in the past two days.